Children are disappearing in a small North Western town outside of Seattle and I don’t care. Much like Mathieu Kassovitz’s crossover attempt Gothika with Halle Berry and Penélope Cruz after the success of Hate (This is a must see) and Crimson Rivers , Pascal Laugier took a shot with Jessica Biel and American audiences. 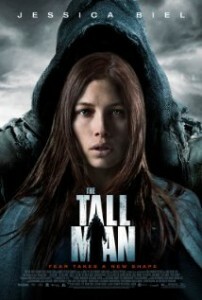 Another twist ending that could rival any M. Night climax, The Tall Man delivers no punch. Beautifully shot and at times well directed, I hope this is not the last we see of this daring French auteur he writes all his own stuff, I just hope not to see another American horror vehicle. Posted on Monday, December 10th, 2012 at 8:31 pm and is filed under Reviews.